If you have a hot tub or other designated area, a pergola is especially useful for defining that specific area of your outdoor living space. An outdoor structure is a perfect accessory for completing any great landscape design. While they are all beautiful and aesthetically pleasing in their own way, they each offer their own unique benefits to your outdoor space. If you are looking to add to your yard this summer, consider these five reasons to invest in a beautiful pergola for your landscape. These simple structures add a visual element to any section of your yard. At Mid-Atlantic Deck and Fence, we build and install your beautiful vinyl pergola as a durable outdoor structure for your home. The vinyl material makes this feature especially low maintenance, as it can be easily cleaned with a quick rinse and will never splinter like traditional wood. As they accessorize your outdoor space, pergolas also provide plants with a sturdy support feature to grow on. Pergolas are great for supporting climbing plants and vines, as well as hanging planters that will extend the colorful look of your garden. While they may not offer the same level of shade coverage as a gazebo, pergolas provide shade to anyone enjoying your garden, outdoor seating area, or hot tub. They are also easy to cover on especially bright days if you want to create more shade for that space in particular. A pergola can also be a useful tool for sectioning off various parts of your landscape or designating certain areas of your yard. 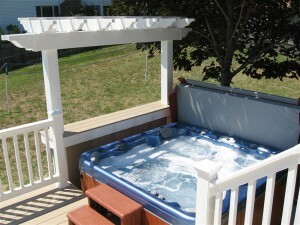 If you have a hot tub or other designated area, a pergola is especially useful for defining that specific area of your outdoor living space. If you are looking for a simple yet beautiful accessory for your landscape design, a pergola is the perfect outdoor structure for your space. These structures can be easily decorated and accessorized with flowers, lights, and other decorations, or they stand beautifully on their own. Ready for a Beautiful Pergola in Your Landscape Design?